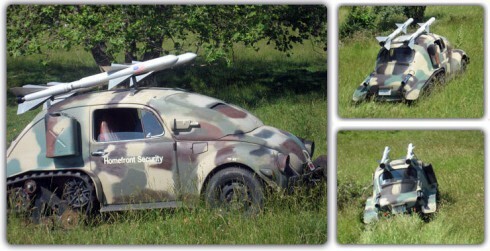 Volkswagen Beetles have been adapted for many things, but a “Homefront Security” missile launcher like this bug is new to me. This VeeDub half-track isn’t the quietest or speediest of weapon systems (video below), but it is definitely a unique VW … and most likely will attract more than just your neighbor’s attention while patrolling the perimeter of your property. BTW, it is For Sale and can be your for the right price.